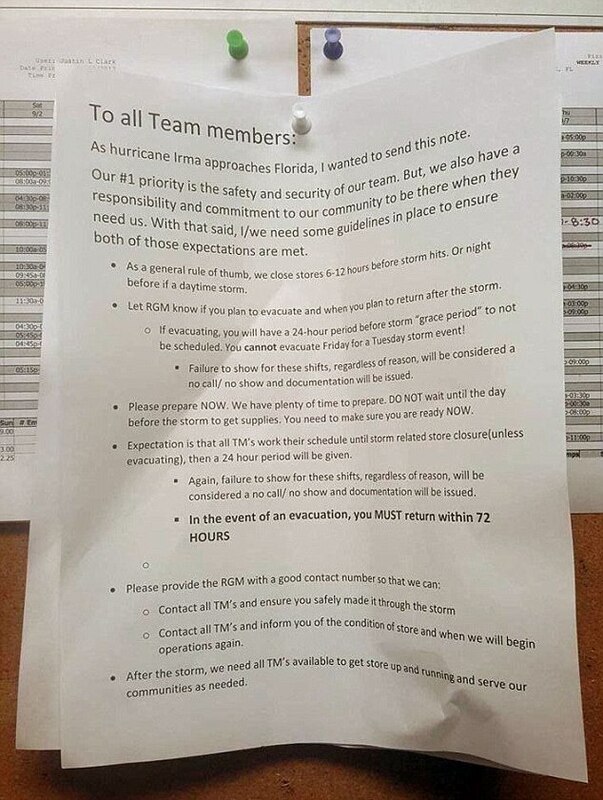 The manager of a Jacksonville Pizza Hut restaurant is in hot water after a photo of their policy on evacuation for hurricane Irma emerged online. "As hurricane Irma approaches Florida, I wanted to send this note." "Our #1 priority is the saftey and security of our team. But, we also have a responsibility and commitment to our community to be there when they need us. With that said, I/we need some guidelines in place to ensure both of these expectations are met." "As a general rule of thumb, we close stores 6-12 hours before storm hits. Or night before if a daytime storm." "Let RGM know if you plan to evacuate and when you plan to return after the storm." "If evacuating, you will have a 24-hour period before storm "grace period" to not be scheduled. You cannot evacuate Friday for a Tuesday storm event!" "Failure to show for these shifts, regardless of reason, will be considered a no call / no show and documentation will be issued." "Please prepare NOW. We have plenty of time to prepare. DO NOT wait until the day before the storm to get supplies. You need to make sure you are ready NOW." "Expectation is that all TM's work their schedule until storm related store closures (unless evacuating), then a 24 hour period will be given." "Again, failure to show for these shifts, regardless of reason, will be considered a no call / no show and documentation will be issued." "In the event of an evacuation, you MUST return within 72 HOURS." Hurricane Irma is believed to have killed nearly 40 people in the United States and Caribbean, leaving millions in Florida and Georgia without power. Social media users were shocked by the guidelines. Pizza Hut responded to the outrage by saying that a manager had contradicted company policy, and that a local franchise operator had addressed the issue. "We absolutely do not have a policy that dictates when team member can leave or return from a disaster, and the manager who posted this letter did not follow company guidelines," the company said.